1. USE A LARGE CIRCLE. It’s best to keep your horse on the largest circle possible (60 feet diameter minimum). An unorthodox method I’ve used for years is to jog up and down the arena as the horse circles around me. This reduces the constant strain on your horse’s legs (due to the periods that the horse moves on a straight line before turning into the next circle.) It also reduces wear and tear on your arena footing because the horse is not pounding repeatedly on the same small area. In fact, it is a lot like riding without a rider. And it's great exercise for you! 2. KEEP THE LONGEING SESSION TIME SHORT. When you introduce your horse to longeing, longe for no longer than 10 minutes in each direction. For more advanced work and longer sessions, build your horse up slowly to make sure her body can handle the demands of longeing. 3. USE EQUIPMENT MEANT FOR LONGEING. 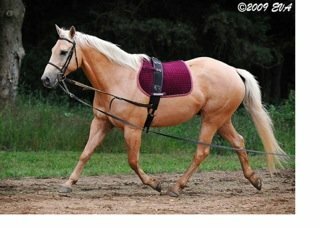 Equipment such as that shown in the photo instead of a saddle also helps support your horse (surcingle, side reins, longe line). 4. TRY TO MAINTAIN A STEADY CONTACT FROM YOUR LONGE HAND TO THE HORSE'S MOUTH. Be especially mindful of what you are feeling in your longe rein hand. Is your horse leaning on it (by pulling away from you constantly), avoiding it (by making the circle smaller and putting slack in the longe line), or a combination of the two (falling in so that you feel nothing then pulling out and hitting the bit abruptly). If longeing doesn't feel good to your horse's mouth, she will quickly come to fear it, fighting you every step of the way. When you first introduce a horse to longeing, she will not stay on a circle. Instead, she will ride on an oval--coming in toward you, then pulling away. This means that the longe line will go slack and then reconnect with your hand. Don't chase your horse away from you. Instead, start your horse out walking on the line and move your hand (and body, if necessary) such that you maintain a steady contact. Once the horse accepts this steady contact, you can remain standing in the middle of the circle and she will seek contact with your hand. The result of this is that she will move around you in a perfect circle. Another unorthodox method that I have used successfully for years is to hold the longe line the same way I hold the reins under saddle: the longe line starts at your horse's mouth, goes between your ring and little finger, then up over the ring, middle, and index finger. Your thumb presses down on the rein as it comes up over your index finger. Held this way, a longe line feels exactly the same way a rein feels when you're riding. If you have "educated hands" (George Morris' term for feeling contact), you will be able to maintain a steady and elastic connection with your horse throughout the longe session. 5. ATTACH THE LONGE LINE IN THE WAY THAT FEELS MOST COMFORTABLE TO YOUR HORSE. If you have feeling hands, the best way is to clip the longe line to the outside bit ring, run it over your horse's head, and then through the inside bit ring. This allows you to maintain a steady and even contact on both ends of the bit, and applies a bit of pressure to the horse at the poll. If you have unsteady or unfeeling hands, use a longeing halter or longeing straps that go under the horse's chin (as shown in the photo). A longeing halter has a ring on the noseband to which the longe line can be attached. This is extremely useful if you have "dead hands", that is, you have not yet developed the skill of maintaining a steady and elastic connection from your hand to the horse's mouth. ON LONGE, YOUR HORSE MUST BE DRIVING FROM BEHIND WITH AN ENERGETIC (FORWARD) PACE. Otherwise, she will become dull and lazy. Done this way, you can teach your horse the beginning elements of collection because impulsion (driving from behind) must be there and well developed before you can ask your horse to carry more weight on her hindquarters. You will feel like you are the apex of a triangle and your hands and arms form two sides of the triangle, keeping your horse in the middle of the third side across from you. 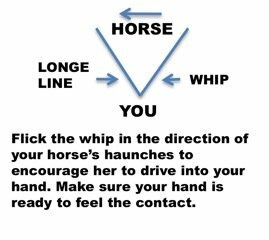 You can also teach your horse the beginning of extension simply by drawing your longe hand out (creating more space between your whip hand and longe line hand). Your horse will seek your hand (seek to reestablish contact with your hand) and will lengthen as a result. By gently squeezing your longe hand again, you can bring your horse back into a shorter frame. Here are some books and equipment that I recommend for longeing.